Imagine your dead grandmother lying in an open field, being attacked by vultures. It's a horrifying thought and may seem like the ultimate indignity. But, assuming she is an "inmate" at one of the human taphonomy facilities around the world, she could be making an invaluable contribution to the advancement of forensic science. 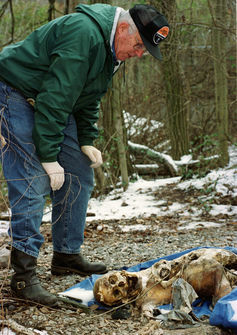 Facilities for human taphonomy, the study of what happens to an organism after its death, or "body farms" as they have become colloquially known, are unique outdoor laboratories where forensic scientists can monitor the processes of human decomposition in a variety of different situations. While the UK and the rest of Europe have so far declined to create any such facility, the growing number of successful body farms in the US and beyond may slowly be changing attitudes. Does a body decompose differently if it is locked inside a car boot or submerged in water? Yes it does. Does it matter if the body is clothed or naked, or wrapped in a duvet? Yes it does. We know the answers to these questions as a result of decades of research being undertaken at body farms around the world. There are currently six functioning facilities in the US, one opening outside Sydney in 2016 and the possibility of one in India. Human decomposition is a complex process, which is very susceptible to changes in ambient temperature, local climate and surrounding conditions. Each of these places has its own peculiar pattern of decomposition. Each environment is different, whether it is the annual rainfall, average temperatures or the species of insect or scavenger that exist in a particular place. In the US, for example, bodies might be affected by raccoon and coyotes, whereas Australian forensic scientists are more interested in the damage dingoes could do to the remains. William Bass, a retired member of the University of Tennessee's body farm. Bodies at the arid Texas state facility will decompose very differently to those at the Fox Valley College facility in freezing Wisconsin. This affects the estimation of the time elapsed since the person died, which is one of the key elements of a forensic police investigation to get right. The facilities are also used to monitor physical, chemical and bacterial changes in rotting bodies, as well as for training archaeologists, anthropologists, police officers and "human remains detection" dogs. For researchers in Europe, knowledge about human decomposition in our climate and temperatures comes from case studies, anecdotal evidence and what we have gleaned from doing animal studies. In the UK, there are several university-based taphonomy facilities that do decomposition experiments on the humble pig, which is a as good an analogue as any. In this way, we can do large-scale experiments, with lots of repeats, creating good-quality science that could be accepted in court. Also, pig carcasses are relatively easy to get hold of, and are less objectionable to most than human cadavers. However, there are important limitations. How does diabetes or cancer affect decomposition rate? What about smoking, or drug use? These kinds of questions could only be answered by doing research on human cadavers. Without a human taphonomy facility, Europe could fall behind the rest of the world when it comes to decomposition research. There have been attempts to create a human taphonomy facility in the UK, most notably by Omega Supplies Ltd in 2010. This failed due to an apparent lack of support from university academics and a general distrust from the public. And on our small, crowded island, finding a suitable location for such a facility is fraught with difficulty. But as the rest of the world continue to set up such facilities, there seems to be renewed interest in such a venture. While there hasn't been much research to garner public opinion, one survey by researchers at Staffordshire University in 2014 suggested there was growing support. Currently, if you donate your body to science in the UK, your body will be used by medical students or trainee surgeons, but there's no option to be used for forensic science. The Human Tissue Authority (HTA) is aware of the situation. One way forward could be for it to make taphonomy research a "scheduled purpose", meaning institutions could apply for a HTA licence to carry it out. If that works, it could open the possibility of a body farm in the UK. Any endeavour involving the bodies of loved ones is going to be controversial, with vocal supporters and critics. And if a facility was to open anywhere new, it would need to be handled with sensitivity and dignity; so that the families of donors can rest assured that bodies are being looked after while they contribute to science.